My favorite way to enjoy tequila is in a margarita, usually with some kind of fruit and blended most of the time, but not always! 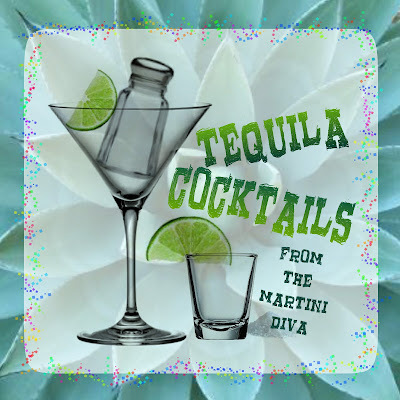 I've been known to enjoy tequila in Old Fashioneds, Bloodies, Collins and even the occasional shot! Below are some my favorites. Trust me, it's a great Tomato Margarita. Day of the Dead & Grateful Dead Inspired Cocktail. Imagine a black moon ice ball melting in a bright sun orange margarita. A Sons Of Anarchy Inspired Cocktail. Cactus Pear Margarita with Goodies. Raspberry Martini, Coconut Colada, Blueberry Margarita Popsicles. A riff on that 70's classic, Tequila Sunset. Just what it sounds like, pomegranate seeds smashed into tequila. A fresh take on the classic grapefruit Mexican cooler. My South of the Border take on a Moscow Mule. Just what you think it is. I absolutely love this one for two reasons, Blackberries are great in margaritas and I love the recipe card I designed for it inspired by the movie, Thelma and Louise. I love cherries, I love margaritas. A sweetheart of a margarita. The color and flavor of blood oranges makes this one a total babe of a cocktail. It's all about the blueberries! Refreshing with a spicy bite - a lovely sip in summer. A perfect use of seasonal summer fruits. A classic margarita for Jimmy Buffett Parrotheads - the recipe card has a cool Scarlett Macaw Parrot on it! A Halloween themed, orange flavored martini with some spooky garnish. A Cactus Pear Margarita Loaded with Mexi Sliders & Happy Hour Treats. Canned or fresh peaches, both work great! Because, you know, Beer! And Margaritas! Concocted especially for Breaking Bad Addicts! 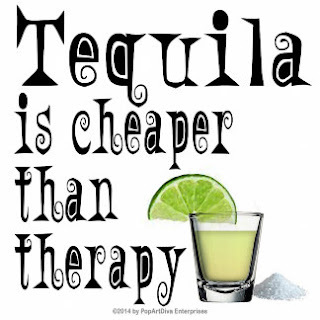 TEQUILA is cheaper than therapy is available on art, decor, stationery, clothing, bar accessories, games and gifts.